MOSCOW, March 9. /TASS/. 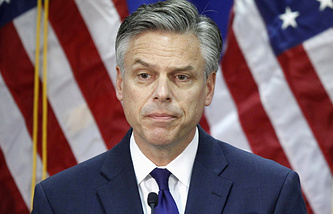 Russia will welcome the appointment of any US ambassador who will be committed to the idea of establishing a dialogue between the two countries, Russian presidential spokesman Dmitry Peskov said in the wake of media reports Utah’s former governor Jon Huntsman may become the head of the US diplomatic mission in Moscow. "We will welcome any new head of the US embassy in Moscow who will display firm commitment to the idea of establishing a dialog between the two countries," Peskov said, adding that the decision on who will head the US embassy in Russia was entirely Washington’s internal affair. "We have no intention to meddle in these internal affairs," Peskov said.